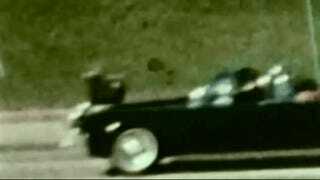 The Zapruder film may be the most famous footage taken of the Kennedy assassination, but it’s not the only one. The “Nix Film” may be lesser known, but it’s no less important. It has been missing for decades, so the granddaughter of the photographer who captured the film is now suing the US government. She wants it returned, or be paid $10 million. It’s yet another episode that adds to the conspiratorial feel of the Kennedy assassination. The original footage, captured 52 years ago on Orville Nix’s Keystone Model K-810 8mm home-movie camera, hasn’t been publicly seen in more than 37 years. As ABC affiliate WFAA reports, Gayle Nix Jackson, the granddaughter of Orville Nix, has filed a federal lawsuit asking for the footage to be returned to her, or to be compensated $10 million. Nix was standing on the opposite side of the street where Abraham Zapruder shot his famous footage, but he still managed to capture the final moments of the President’s life—including the final shot to his head. Though darker and less detailed, it’s a mirror image of the Zapruder film. Shortly after the assassination, Nix gave the film to the FBI, who returned it three days later. United Press International (UPI) purchased it from Nix for $5,000 and took possession of it on December 6, 1963. Copies were made and distributed to UPI subscribers. It was examined by the Warren Commission in 1963, and then again in 1978 by the House Select Committee on Assassinations. The HSCA [House Select Committee on Assassinations] was the last to acknowledge having the original Nix film in its possession, and its whereabouts unknown to this day. When the HSCA was disbanded, its files and exhibits including the original Nix film should have been stored and kept at the National Archives and Records Administration in College Park, Maryland. The National Archives says it has copies, but not the original. Interestingly, Nix told a filmmaker in 1966 that the film he received back from the FBI was not identical to the one he shot.